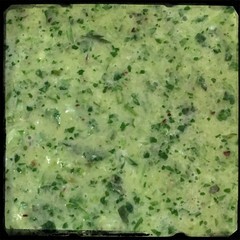 Puerto Rican Chimichurri is mainly used as a fresh sauce to garnish grilled meats, especially beef and pork. To say the flavor is intense is an understatement. It’s packed with cilantro and culantro (recao) which make it very aromatic. Since recao is an herb that is very similar in taste and aroma to cilantro, it’s very polarizing. Generally, people who like cilantro will enjoy this, others may not.